Interior decorator Chris Gilmour from Island Living Interiors was set the task of redesigning the tired home, the goal to lighten, freshen and expand. Eight months of work has transformed it into the stunning home of today, one which now better reflects its history and surroundings. The renovation was influenced by the original characteristics of the property and inspired by the owner’s art collection. Space had to be used wisely and creatively, to ensure each small room was functional and inviting. A major challenge was to create a sitting room that could fit 11 people, where the original space only seated five. The clever use of ottomans and feature chairs has helped to ensure the space doesn’t look overcrowded, making it perfect for family gatherings and parties. 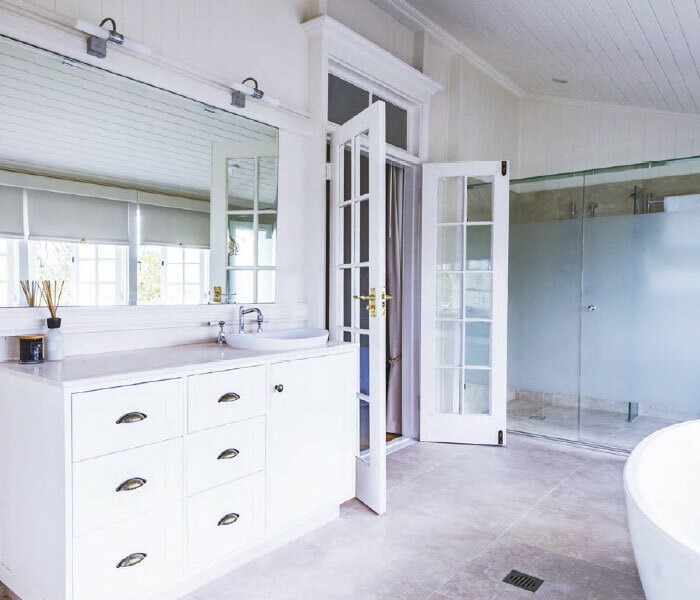 The crowning glory of this home is the knockout bathroom. 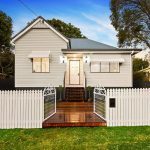 The once Asbestos-riddled study was transformed into a luxurious space with the help from the expert team at O’Shea and Sons Builders. 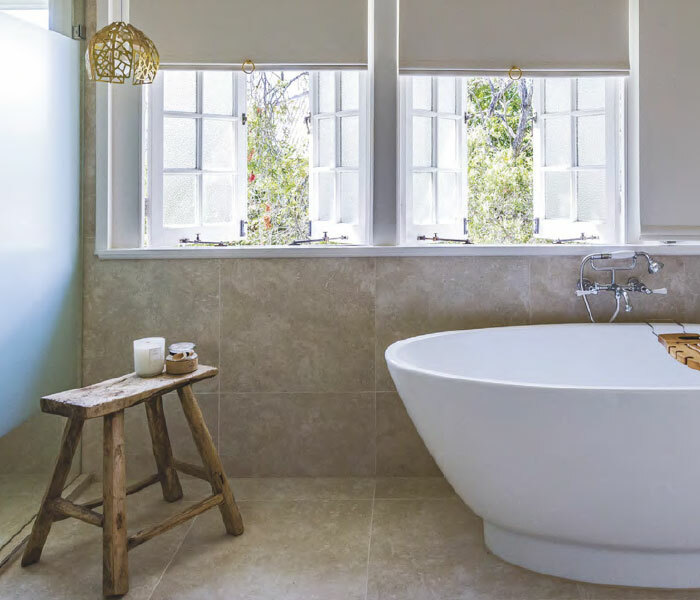 The stunning new bathroom seamlessly links the classic styling and the light and fresh design brief given by the owner, with the use of frosted glass, heated towel rails, Georgian Bastow tapware and a stunning freestanding Kado Cirque bath from Reece. Another standout feature of the home is the beautiful wide pine floor boards. However, their dark tone lacked appeal. To spruce them up they were stripped, sanded and then coated with a light varnish to restore their natural colouring. Stylistically, this brought the whole cottage into the 21st century. 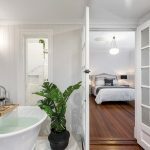 The owners wanted to pay tribute to the history of the worker’s cottage and to do so the decorative timber elements of the home needed to be restored. Each traditional feature of the cottage was reconditioned, including the original skirting boards, picture and belt rails. Updating the feature arches and moldings guaranteed the classic feel of the home was retained. 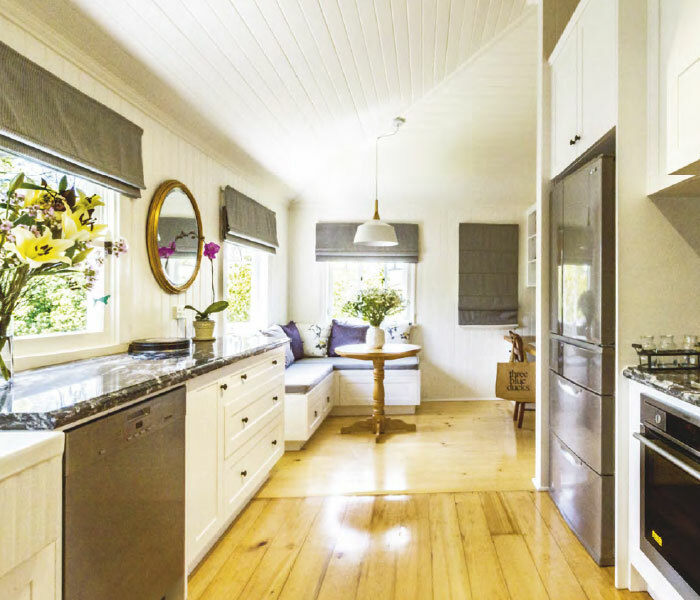 A simple colour palette was chosen for the kitchen, to ensure the classic cottage styling was adhered to. 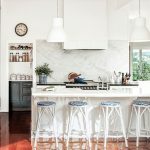 Dulux Antique White in a solid 2pac was used for all of the custom designed kitchen cabinetry, crafted by timber experts Buywood Furniture, who also made the custom designed entertainment unit and vanity in the home. This classic effect aided in brightening the once dark space, while the grey marble benchtops added contrast to the neutral colour palette. The large custom-made American Oak extension table proved to be both practical and stylish. 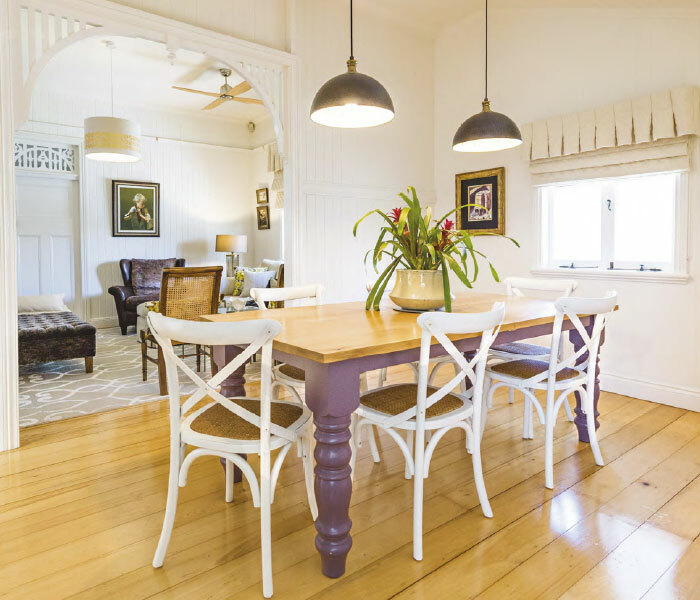 Designed and made by furniture artisans RAW Sunshine Coast, this piece effortlessly links the kitchen and dining area, with its oversized turned legs in Dulux Fiji Coral and the table top’s natural wood finish. The white cross back Hamptons-style chairs and the traditional pendant feature lights with their gold Capiz shell interior add the finishing touches to the space. The soft furnishings and roman blinds featured throughout were hand picked and crafted by the team at Lunique. The light colour of the blinds textured fabric and the chosen pelmets soften the edge of the windows and help to create rooms that appealed to the owner’s classic taste. 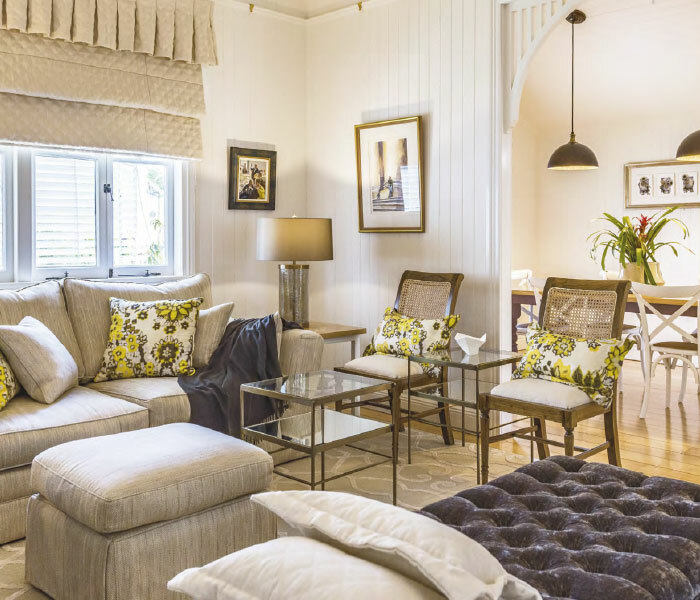 The soft furnishings unite each room by following a neutral colour scheme, with whites, creams, citrus, plum, mauve and soft greys used throughout the home. 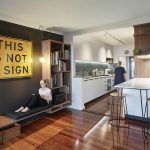 Thanks to the expertise and creativity from Island Living Interiors and the teams at O’Shea & Sons, Buywood Furniture, Lunique and RAW Sunshine Coast, this worker’s cottage has been brought back to life, creating a much-loved home that will be enjoyed for many years to come.